Prime Minister Narendra Modi spoke to Emmanuel Macron last evening, congratulating him on his victory in French Presidential election. The Prime Minister added that he is looking forward to working with Macron to further deepen the cooperation between India and France. 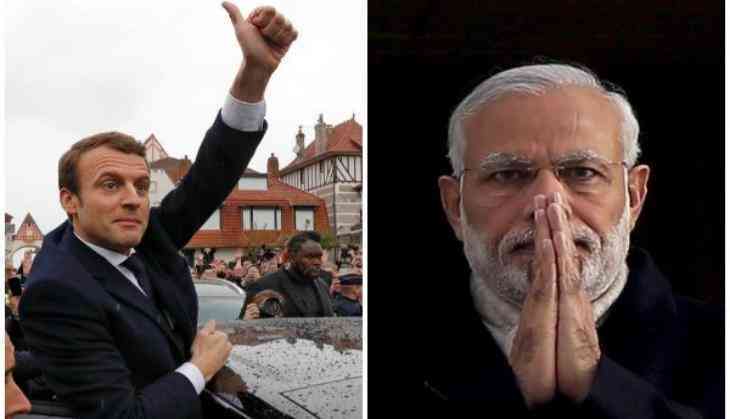 Prime Minister Modi had earlier greeted Emmanuel Macron for his 'emphatic victory' in the French Presidential election. Pro-European centrist leader Emmanuel Macron was elected as President of France last week. The 39-year old former investment banker, who has never held elected office, became the youngest President and occupant of the Élysee Palace. Macron will also become the first President from outside the two traditional main parties since the modern republic's foundation in 1958. At a victory party outside the Louvre Museum in Paris yesterday, Macron said the country has sent an incredible message to itself, to Europe and the world, adding that he would "guarantee the unity of the nation and defend and protect Europe." Marine Le Pen, his far-right opponent in the Presidential runoff, quickly called Macron to concede her defeat after voters rejected her "French-first" nationalism by a large margin. The French Interior Ministry said with 93 percent of the votes counted, Macron had about 19.3 million votes, while Ms Le Pen secured about 10.4 million.